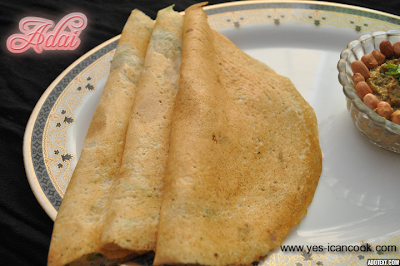 Adai are like Uthappam but the batter is prepared using additional lentils and in different ratios. They are tasty and are amazing. You can make them thin or thick, crispy or soft as desired. I learnt to make these from my mother. Soaking is required but no fermentation is needed. 1. Wash and soak the rice and all the lentils for 6-8 hours. 2. Grind the rice and the lentils to a batter of dosa batter consistency by adding water as required. 3. Add onions, green chillies, coriander leaves and mix well. 4. Add salt and soda powder and mix well. Keep it aside for about 30 minutes. 5. Heat a tawa and when it is hot pour a ladle full of batter and spread it either thin like a dosa or thick like an Uthappam. 6. Sprinkle oil and cook on medium flame till done. You can cook them crisp if desired. Flip and cook on the other side if required. 7. Cook adais with the remaining batter.